Work is sending me to Dunedin for a few weeks. Last time I was in Dunedin, I did a sampling of a number of Indian restaurants which I wrote about here and here. 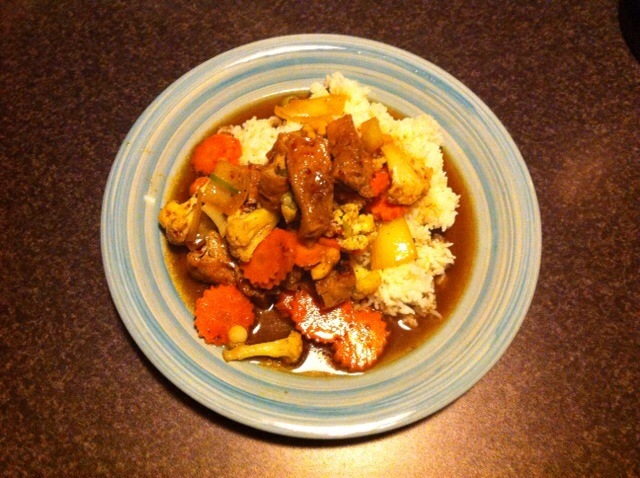 This time, I did a poll of readers and the winning result for week 1 was Thai. One of my favourite types of cuisine after Indian. So Monday night, I wandered along to the Octagon where the nearest Thai restaurant was. Thai Hanoi is actually part of a chain which I’ve eaten at a number of time in the past – usually the Queenstown one. They have a fairly extensive dine in and takeaway menu and most dishes have vegetarian options – including meat free with just vegetables or with Tofu. They also have a number of Vietnamese options on the menu. 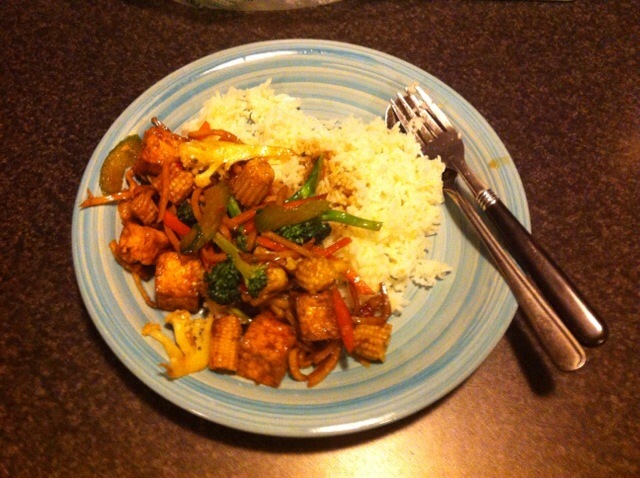 I picked the Chilli and fresh basil – with Tofu. This was $18.50 and came with a serving of jasmine rice. For a cold Monday night there were a number of tables occupied and a steady stream of phone orders. There did appear to be some confusion from the staff about which takeaways were mine as they offered me a number of them and each time I said “no, that’s not mine“. After a number of times the man that took my order said “what did you order?” – he looked puzzled and disappeared into the kitchen. I have a sneaky suspicion they lost my order. Even so, it didn’t take too long to arrive. As I usually do, I served about half for dinner and put the other half aside for lunch. It was very tasty, a little sweet, garlicky I suspect 🙂 and fairly spicy. I like spicy food and it wasn’t too much, but had a little bit of a kick to it. I could have easily eaten the entire serving as it was so delicious! For Tuesday night, I waited between sleet showers and ventured out into the cold of Dunedin and vowed to stop at the first Thai place I found (Hanoi Thai excluded). Well after a while I wished I had picked another type of cuisine – Indian, Japanese, Turkish were in abundance but not a Thai restaurant to be found – until I came across Thai 1 On. This is obviously a family run business. There was a school aged girl eating her dinner and watching TV in the corner. Mrs took my order and Mr was in the kitchen. I picked the Vegetarian Stirfry with Cashews. All vegetarian options come with tofu unless you request not to have it. Cost was $14 including jasmine rice. This was a much larger serving than Monday nights offering from Thai Hanoi. It too was a sweetish dish, but after the previous night’s dish with the chilli, this just didn’t have that “wow” factor. It wasn’t bad, it just wasn’t rave worthy. The jasmine rice was actually a little mushy for my liking. Service was super quick and friendly though so big thumbs up for that. 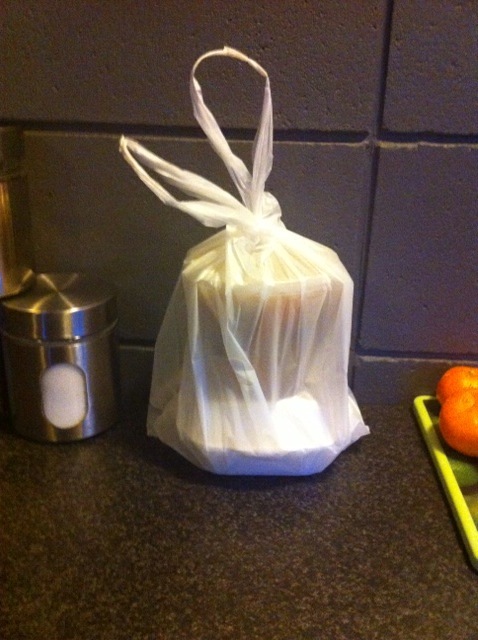 Interestingly, upon going to reheat the leftovers for lunch the next day, it was pretty greasy in the bottom of the takeaway container – probably not a particularly healthy choice. Wednesday night, heading straight from work, I aimed towards Chilli Planet. I arrived around 5.15pm and they were just getting setup for the dinner service and I was the only customer. Unlike most Thai restaurants which usually list “most meals can be made vegetarian” or have Tofu listed as a choice next to the meat options, Chilli Planet actually list all their vegetarian offerings separately. 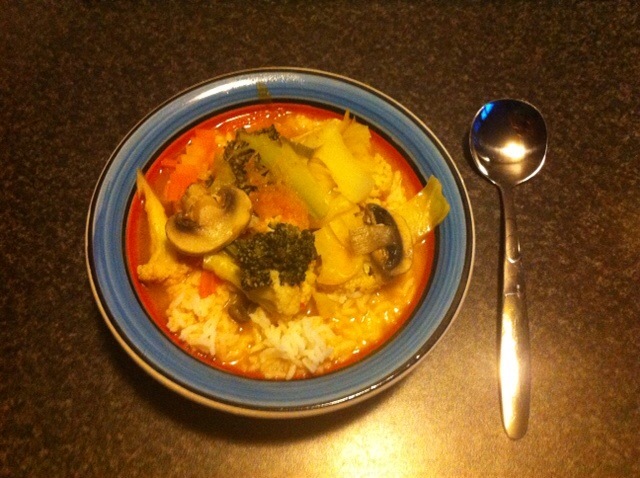 I chose the Tom Yum Mushroom Soup which comes with jasmine rice. Cost $17.50. I chose medium spicy, and it was a little spicier than I expected but very flavourful. It didn’t seem at all oily or greasy, which after the reheated leftovers at lunch was probably a very good thing. It didn’t seem a large serving, the bowl in the picture is a desert or cereal bowl and is around half of what I was given. Also there was no protein in the form of tofu or nuts so I suspect I will be super hungry by breakfast. And while I was hoping to leave the best until last, actually the opposite is true. The final “Thai” meal, and in this case I use the word Thai loosely, was from the Golden Centre Mall Foodcourt. The chosen “Thai” place was called Top Chef. I don’t know where the chef received training but they should get a refund on their cooking lessons. Why this place is so popular, I do not know! Its a self service type buffet setup. Two choices of plate size – I’m very glad I got small. The small plate was $9.50. You get to fill your plate once – which is one time too many IMO. I asked about vegetarian items and was confirmed that the mini-samosas, spring rolls and dumplings were all vegetarian. I didn’t ask about other vegetarian items and suggestions weren’t offered. I chose to put on my plate vegetable fried rice – there was a choice of noodles. 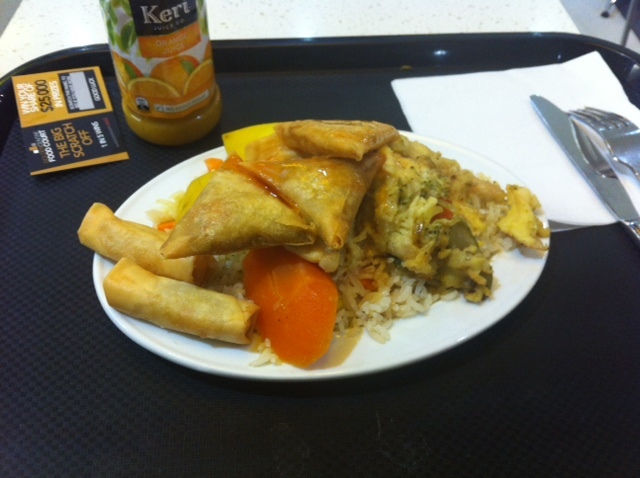 I also selected “potato curry” (with carrot), egg fu young, 2 spring rolls, 2 samosas and 2 dumplings. There was also lemon and sweet and sour sauce. So in summary, the closest thing the potato curry saw to curry was the name tag – tasteless. The egg fu young was salty and it had chicken hidden in it – sneaky! Usually on these self serve places the egg dishes are vegetarian or have pork in which is obvious – foolish me, I should have asked! The samosas and spring rolls were fine – they are standard mass produced, drop the in fryer, packets of greasy yum… you can’t go wrong with those. I had high hopes on the dumplings but I have a sneaky suspicion they had meat in them. It was hard to tell what the congealed putty like substance was in them but it wasn’t very nice. The sweet and sour sauce was runny and tasteless too. Should have gone back to Thai Hanoi for their lunch special.